On the corner of Pender and Granville in downtown Vancouver, a familiar and some would argue intoxicating aroma of heated grease, charred meat and smoke wafts around a simple food truck. When I first walked by Burger $2.85, I was transported back to my kitchen at the precise moment where I would use high heat to sear off my steak on the stove top before throwing it into the oven (minus the occasional blaring of the smoke detector and swearing). I have to admit after tasting my first cheeseburger from the cart, I didn’t get what all the fuss was about. I was actually planning to do a food rumble pitting the Burger $2.85 cheeseburger against other budget friendly and basic burgers. However after eating at a few food court burgers, I realize the error of my initial assessment and how awesome the cheeseburger from that humble food cart is. I think to truly appreciate Burger 2.85, I realized that this burger is not meant to be compared with gourmet burgers with fancy toppings from places like Romers or Stackhouse. To be honest, if places that serve highfalutin burgers and charging the price to match cannot beat a food cart burger, then there are issues. Instead, this humble burger is a stealthy good basic burger, typically served by fast food outlets and simply satisfies a craving for charred beef. The two outstanding aspects of the Burger 2.85 burger are its excellent beef patty and the quality bun. The beef patty is homey in a good way. It actually tastes like beef, which is surprising given the price and doesn’t always happen in fast food editions. In addition to its beefy flavour, the patty is prepared so that it has a nice charred taste to it too. The meat also has a nice texture as well; firm without being overly dense. The next thing which makes this burger great, is it uses a fairly soft bun that holds in all the ingredients without turning into mush. Despite having wet items like sauce, tomatoes and iceberg lettuce, the toasted bun didn’t disintegrate from the moisture of the veggies. The bun was sturdy but was still soft and enjoyable. Now I always prefer cheeseburgers to hamburgers, so I coughed up the extra 65 cents. In return, a slice of processed /American cheese was slapped onto the patty. The cheese was nicely melted and clung onto the patty neatly. 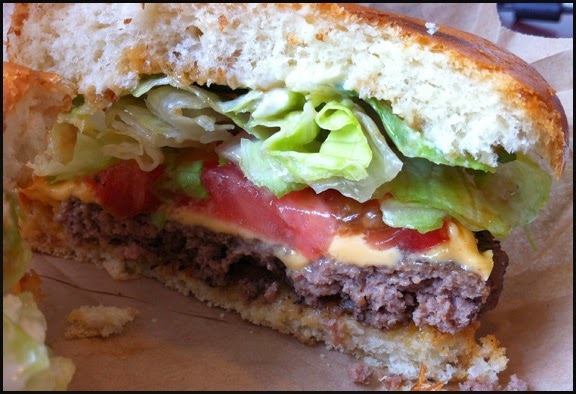 The burger is completed with a wedge of fresh iceberg lettuce and think cut slices of tomatoes. The only thing I didn’t care for was the inclusion of an okonomiyaki sauce. I didn’t like its sweetness and gingery flavour. 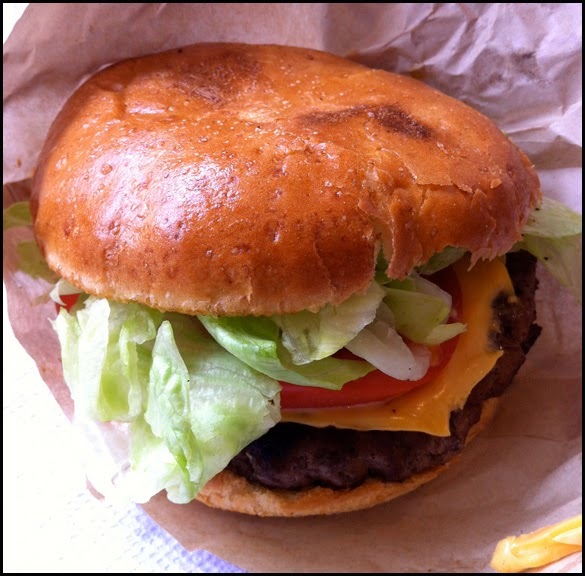 Overall the tasty cheeseburger from Burger $2.85 is flavourful and made with fresh ingredients. For $3.50 it is a much better alternative than grabbing a burger from a fast food outlet.